This name uses Spanish naming customs: the first or paternal family name is Palmeiro and the second or maternal family name is Corrales. Rafael Palmeiro Corrales (born September 24, 1964) is a Cuban American Major League Baseball first baseman and left fielder for the Cleburne Railroaders of the American Association of Independent Professional Baseball. Palmeiro was an All-American at Mississippi State University before being drafted by the Chicago Cubs in 1985. He played for the Cubs (1986–1988), Texas Rangers (1989–1993, 1999–2003), and the Baltimore Orioles (1994–1998, 2004–2005). He was named to the MLB All-Star Team four times, and won the Gold Glove three times. He is a member of the 500 home run club and the 3,000 hit club and is one of only six players in history to be a member of both. Days after recording his 3,000th hit, Palmeiro received a 10-game suspension for testing positive for an anabolic steroid. Palmeiro was recruited by Ron Polk and enrolled at Mississippi State University, where he played college baseball for the Bulldogs in the Southeastern Conference (SEC). He was the first of two players to have ever won the SEC triple crown, both of whom are Mississippi State products. A teammate of Will Clark, the two were known as "Thunder and Lightning". Clark and Palmeiro were known to dislike each other, dating back to their time at Mississippi State. On June 11, 1985, Palmeiro signed with the Chicago Cubs as the 22nd pick in the 1st round of the 1985 draft. Palmeiro debuted on September 8, 1986 in a game between the Chicago Cubs and Philadelphia Phillies at Wrigley Field, as a left fielder. In his first season, he played 22 games, having a .247 batting average while having 12 RBIs and 3 home runs. In the next season, he played in 84 games, garnering 61 hits, 14 home runs and 30 RBIs with a .276 average. During his tenure with the Cubs, he normally played left field, though occasionally he would play other outfield positions or first base. Palmeiro was the runner up to National League batting champion Tony Gwynn in 1988 with a .307 batting average, only six points below Gwynn's. He had 178 hits, 8 home runs and 53 RBIs in 629 plate appearances and 152 games. He was named to the 1988 MLB All-Star Game, the first in his career. During that year rumors spread about a relationship between Palmeiro and Ryne Sandberg's wife, Cindy. This led to issues in the locker room and after the 1988 season, Palmeiro was traded by the Cubs to the Texas Rangers along with Jamie Moyer and Drew Hall in exchange for Mitch Williams, Paul Kilgus, Steve Wilson, Curtis Wilkerson, Luis Benitez, and Pablo Delgado. Upon moving to the American League, Palmeiro was primarily used as a first baseman or designated hitter. Palmeiro blossomed as a hitter while with the Rangers, leading the league in hits in 1990 and doubles in 1991. In 1989, he hit for .275 that season, having 64 RBIs, 8 home runs and 154 hits. In 1990, he was third in the American League in batting. He hit for .319 during the season, while having 89 RBIs and 14 home runs and leading the league in hits. He hit 49 doubles in 1991 (a season high along with career high), while having 203 hits, 26 home runs and 88 RBIs for a .322 batting average. He was named to his second career All-Star Game that year. He dipped in every category in 1992, having 163 hits, 22 home runs, 85 RBIs and a .268 batting average. He bounced back the following year (a contract season), having a career high 124 runs, 176 hits, a career high 37 home runs along with 105 RBIs and a .295 batting average. He was offered a five-year contract worth $26 million after the season. Despite that fact, he left the Rangers for the Orioles after they signed ex- Mississippi State teammate Will Clark. Instead of getting a better deal, they signed Will Clark instead (for $30 million and five years), causing Palmeiro to call him a "low life", though he later apologized for saying that. Palmeiro signed a 5-year contract, worth more than $30,000,000. In his first season as an Oriole, Palmeiro hit 23 home runs, a season that was abbreviated due to a work stoppage. He had 76 RBIs (the last time he would have less than 100 RBIs until 2004) along with a .319 batting average. Prior to Palmeiro's 1995 season, he had hit more than 30 home runs only once (37 in 1993). Starting in 1995, Palmeiro began a streak of 38+ home run years that continued through the 2003 season. He hit 373 home runs during this nine-season span, while also driving in over 100 runs in each of these seasons. However, Palmeiro never led the league in home runs, and he is history's most prolific home run hitter to have never won the home run crown. That season, he led the team in home runs, batting average, and runs batted in. In the 1996 season, he hit 39 home runs, 181 hits, and 142 runs batted in and helped the Orioles qualify for the American League Wild Card. This was both his first postseason appearance in his career along with the first postseason appearance for the Orioles since 1983. In his first postseason, he had seven total hits, six RBIs and a combined .205 average while playing in all nine games the Orioles played, as they beat the Cleveland Indians in the 1996 American League Division Series to advance to the 1996 American League Championship Series before being beat by the New York Yankees. He finished 6th in MVP balloting, his highest finish up to that point in his career. Despite having 109 strikeouts (a career high) and a .254 batting average, he had 110 RBIs, 156 hits along with 38 home runs in 1997 as he helped the team win their division for the first time since 1983. He also was awarded the Rawlings Gold Glove Award that season, his first ever. In the 1997 American League Division Series, the Orioles beat the Seattle Mariners in four games. In the postseason, he had 10 combined hits along with 2 RBIs and 1 home run and a .265 average in the 10 games he played in the postseason, as the Orioles once again advanced to the ALCS after beating the Seattle Mariners before losing to the Indians in six games. This would be the last time the Orioles would make the playoffs until 2012 and last time they would win a division title until 2014. The next season, his last with his first stint with the Orioles, he hit 43 home runs, to lead the team for the 4th time. He had 183 hits along with 121 RBIs and a .296 batting average. He was named to the 1998 MLB All-Star Game, his first since 1991. He also won a Gold Glove for the second straight year along with his first Silver Slugger Award, while finishing 18th in MVP balloting. In his time with the Orioles, he received MVP votes each year, though he never finished higher than 6th. Palmeiro was offered a 5-year, $50,000,000 deal to stay with the Orioles, but instead agreed to a 5-year, $45,000,000 contract to return to the Rangers in 1999, citing a desire to be close to family (he had remained in the Dallas area during his time with the Orioles). Palmiero played an average of 157 games per season in his second tenure with the Rangers. He had 47 home runs in his first season back with the Rangers, while hitting for .324 and having 183 hits. He finished 5th in the MVP balloting, his highest finish ever while being named to the 1999 MLB All-Star Game, his fourth and final selection. He was awarded the Gold Glove for the third straight year along with winning the Silver Slugger Award for his second straight and final year. The Gold Glove win was not without controversy, as he only appearaed in 28 games as a first baseman while playing in compared to 128 games as the designated hitter. He finished 5th in the MVP balloting, having garnered a .324 batting average, 47 home runs, and 148 RBIs, all improvements from the previous season. He hit over 100 RBIs in each of his five seasons, along with 805 hits. He hit 214 home runs with the team in that span, though his batting average dipped each year, hitting .260 in his final year in 2003. His first season resulted in a division title. In the 1999 American League Division Series, his team was swept by the Yankees in three games. He had three hits and a .273 average for the series. This was his last postseason appearance. The team would finish last place in his remaining four seasons. 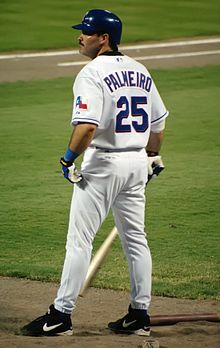 Palmeiro was one of the few bright spots for the Rangers from 2000–2003, when he left the Rangers to re-join the Orioles. 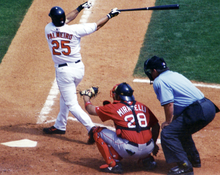 On May 11, 2003, Palmeiro hit his 500th home run off David Elder in a game against the Cleveland Indians. In 10 total years with the team, he played in 1,573 games, garnering 1,692 hits, 321 home runs and 1,039 RBIs while compiling a .290 batting average. Palmeiro re-signed with the Baltimore Orioles in 2004, on a 1-year, $4,000,000 contract. In his press conference, he claimed he was "a little bit older, a little bit wiser". He also said he didn't want to retire until he rejoined the Orioles and if he was inducted to the Hall of Fame, he would do so as an Oriole. His power fell significantly his first season back with the Orioles, having 142 hits, along with 23 home runs, 88 RBIs and a .258 batting average, all drops from the previous season. Despite this, he became one of only four players (the other three being Ken Griffey Jr, Mark McGwire, and Manny Ramírez) in history to hit at least 200 home runs for two different clubs, doing so on September 13, 2004 off Justin Miller. Entering 2005, he was just 78 hits shy of 3,000. He hit his 563rd home run that season, passing Reggie Jackson on the all-time list. Just a few weeks later, on July 15, Palmeiro joined Hank Aaron, Willie Mays, Alex Rodriguez, and Eddie Murray as the only players in major league history to get 3,000 hits and 500 home runs. Not long after his achievement, Palmeiro was suspended 10 days for testing positive for steroids. He claimed he received a tainted vitamin b12 shot from Miguel Tejada. Upon returning, he only played a few more games. He was booed by the home fans. He was sent home due to a nagging injury, but was told to stay home – largely because of his attempt to implicate his teammate. As of April 2016, he has yet to return to Baltimore. In his final season, he had 98 hits, 18 home runs, 60 RBIs and a .266 batting average in 110 total games played. On September 17, 2015, it was announced that Palmeiro would sign with the Sugar Land Skeeters of the Atlantic League of Professional Baseball to play alongside his son, Patrick Palmeiro, for one game. Palmeiro appeared in only one game for the Skeeters on September 18, 2015. Skeeter fans quickly gave him the nickname "The Saccharin Slugger." Palmeiro announced on January 5, 2018 that he wanted to return to Major League Baseball. On May 9, 2018, it was announced that Palmeiro and his son Patrick signed with the Cleburne Railroaders of the American Association of Independent Professional Baseball. On May 22, 2018 he hit his first professional home run since July 2005 when he was with the Orioles. On March 11, 2019, Palmeiro and his son re-signed with the Railroaders for the 2019 season. Palmeiro won three straight Gold Glove awards as a first baseman in the American League from 1997–1999. In 1999 he only played 28 games at first base. Palmeiro lives in Colleyville, Texas with his wife. His son Preston played baseball for North Carolina State University and was drafted by the Baltimore Orioles organization in 2016. ^ Norwood, Andrew (April 29, 2015). "SEC Storied: Thunder & Lightning to Premiere Monday". Maroon and White Nation. FanSided Inc.
^ Chass, Murray (9 March 1994). "BASEBALL; Thoughts Deep in the Heart of Texas". New York Times. Retrieved 8 October 2014. ^ "Rafael Palmeiro". Baseball-Reference.com. Retrieved January 19, 2011. ^ "Retrosheet Boxscore: Chicago Cubs 7, Philadelphia Phillies 4". ^ "Palmeiro Apologizes To Clark". tribunedigital-chicagotribune. Retrieved 2016-12-26. ^ Chass, Murray (1993-12-13). "BASEBALL; Orioles Land Palmeiro For $30 Million, 5 Years". The New York Times. ISSN 0362-4331. Retrieved 2016-12-26. ^ Chass, Murray (1998-12-02). "BASEBALL; Belle to Orioles, But Palmeiro Heads to Texas". The New York Times. ISSN 0362-4331. Retrieved 2016-12-26. ^ Jeff Sullivan (2 December 2011). "Searching For A Defense Of Rafael Palmeiro's 1999 Gold Glove". SBNation.com. Vox Media. ^ Sun, Baltimore. "Rafael Palmeiro through the years". baltimoresun.com. Retrieved 2016-12-26. ^ "Palmeiro suspended for steroids, denies intentional use". ESPN.com. 2005-08-02. Retrieved 2016-12-26. ^ "Palmeiro sent home by Orioles | Peninsula Clarion". peninsulaclarion.com. Archived from the original on 2016-12-26. Retrieved 2016-12-26. ^ "The rise and fall of Rafael Palmeiro | FOX Sports". FOX Sports. 2016-04-18. Retrieved 2016-12-26. ^ "Rafael Palmeiro to play for Sugar Land Skeeters of Atlantic League". ESPN.com. ^ Wray, Brad (HouWray) September 18, 2016, 9:08. Tweet. ^ "Railroaders sign Palmeiro, son". Cleburne Railroaders. May 9, 2018. Retrieved May 9, 2018. ^ "Railroaders Re-Sign Palmeiros for 2019". Cleburne Railroaders. March 11, 2019. Retrieved March 11, 2019. ^ "Mississippi State University M-Club Alumni Association & Sports Hall of Fame". HailState.com. ^ "Rafael Corrales Palmeiro". Mississippi Sports Hall of Fame and Museum. ^ Bloom, Barry (2010-01-05). "Cooperstown calls for Alomar, Blyleven". MLB.com. Retrieved 2011-01-05. ^ 2014 Hall of Fame Voting. Baseball-Reference.com. ^ "Palmeiro docked 10 days for steroids". ESPN.com. ^ "Players suspended under baseball's steroids policy". espn.com. 2006-06-07. Retrieved 2007-07-20. ^ Arangure, Jr., Jorge (August 2, 2005). "Palmeiro Suspended For Steroid Violation". The Washington Post. Retrieved May 22, 2010. ^ Chass, Murray (December 28, 2005). "Palmeiro Cites His Own Naïveté and Ponders Mystery of It All". The New York Times. Retrieved May 22, 2010. ^ "Congress won't charge Palmeiro with perjury". ESPN.com. ^ Boyd, Flinder (17 Mar 2017). "The rise and fall of Rafael Palmeiro". Retrieved 6 May 2017. ^ Baltimore Sun (19 August 2005). "Palmeiro provided no details about test". baltimoresun.com. ^ "Source: Palmeiro named Tejada before panel". ESPN.com. ^ a b Arangure, Jr., Jorge (November 11, 2005). "Congress Declines to Prosecute Palmeiro for Perjury". The Washington Post. Retrieved May 22, 2010. ^ "Miguel Tejada excerpt from Mitchell Report". Houston Chronicle. ^ Baltimore Sun (30 June 2006). "Palmeiro speaks". baltimoresun.com. ^ "ESPN.com: Page 2 : Pass the B-12". ^ Chass, Murray (November 13, 2005). "Resolution, and Doubts, Regarding Palmeiro". The New York Times. Retrieved May 22, 2010. ^ "Mitchell Report" (PDF). pp. 103–06, 203. ^ Crasnick, Jerry. "Palmeiro now laying low with tarnished image". ESPN. Retrieved January 19, 2011.